Thousands of car accidents occur in construction work zones every year, resulting in serious injuries and preventable deaths. Rear-end crashes, sideswipe collisions, and fixed-object collisions occur in construction zones at all times of the day and night, whether or not active work is going on at the time. 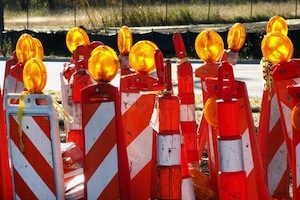 Many factors are typically involved in a construction zone car accident, and more often than not, multiple defendants, including other drivers, construction workers, private contractors, and county, state and federal government agencies, are responsible parties. Robert N. Katz and the attorneys at Katz Wright Fleming Dodson & Mildenhall LLC in Atlanta have the knowledge, skills and experience necessary to comb through the facts of complicated construction zone car accidents and hold all responsible parties accountable for their negligence or reckless acts. Narrowed lanes - Cones, barrels and concrete barriers may all be used to gradually or quickly narrow the lanes available for driving. Drivers often suddenly find themselves with less room to maneuver and little or no shoulder, increasing the chances for a sideswipe accident or collision with oncoming traffic. Absence of lane markings - Stripes may be painted over or covered with dirt or other debris, creating confusion among drivers and affecting their ability to differentiate between lanes. A confused driver may collide with another vehicle or force someone off the road. Construction equipment moving in and out of zone - Large, heavy machinery, such as bulldozers and dump trucks, can block driver view of dangers ahead. Also, large trucks typically travel much more slowly than other traffic in the zone. This speed differential can be deceptive and lead to a serious collision. Workers in the roadway - Flagmen and other workers may be in or near the roadway. An inattentive driver may overcompensate when suddenly encountering a flagman and slam on the brakes or switch lanes without looking first setting off a chain reaction. Road debris - A driver who suddenly comes upon a stray traffic cone, wood, rocks or other debris in the roadway may overreact and come to a sudden stop or swerve into another lane or even into oncoming traffic, colliding with another vehicle or forcing another car off the road or into a crash. Even fine particles such as sand blown onto the road from the construction site can be disastrous, especially for smaller vehicles such as motorcycles. Construction zone car accidents are rarely straightforward, and often times require a large amount of resources to fight against insurance companies and their lawyers.. It is important to retain an experienced personal injury lawyer to advise and represent you throughout the process of obtaining compensation for your injuries. Atlanta attorney Robert N. Katz and his team are nationally recognized for excellence in the practice of law by leading lawyer rating services such as Super Lawyers, Martindale-Hubbell, and AVVO. If you have been injured in a construction zone car accident in Atlanta, Marietta, Decatur, Stone Mountain, or neighboring areas, contact Katz Wright Fleming Dodson & Mildenhall LLC at (404) 460-0101 for a free consultation about your rights to receive compensation for your medical expenses, lost wages, pain and suffering and other legal damages.